Just a few minutes from town, with secure off street parking for cars boats, trailers trucks and more. facilities on one site including a Function room and large kitchen. freshwater swimming pool 36- 38 degrees, 24 in-room Private GENUINE Thermal MINERAL Pools, Two additional THERMAL MINERAL Pools for the basic en-suite studio guests use. Plus a Large REDWOOD SAUNA Room. Keeping warm is Guaranteed. "LAKE VIEW QUEEN BED STUDIO" 1-2 persons Spacious open plan units, Units furnished with queen bed and large Lazy boy chair to lazy away the day soaking in the view of the lake. Kitchen has a cook top, microwave and coffee/tea making facilities, table and chairs. These units all have private Genuine thermal mineral plunge pools and en-suite bathrooms. They have 48” TV's with 60+ channels of SKY. Units are designed to take full advantage of the large grass area in front of the motel and the spectacular views of the lake. There are BBQ tables and chairs in front of these units for twilight BBQ s. Comfortable units with all that's needed to relax for the week and explore the delights of Taupo or just unwind in-house. "LAKE VIEW QUEEN BED STUDIO" 1-2 persons Spacious open plan units, Units furnished with queen bed and a view of the Lake. Kitchen has a cook top, microwave and coffee/tea making facilities, table and chairs. This units has access to a private Genuine thermal mineral plunge pool. This unit has a 32” TV's with 60+ channels of SKY. Units are designed to take full advantage of the large grass area in front of the motel and the spectacular views of the lake. 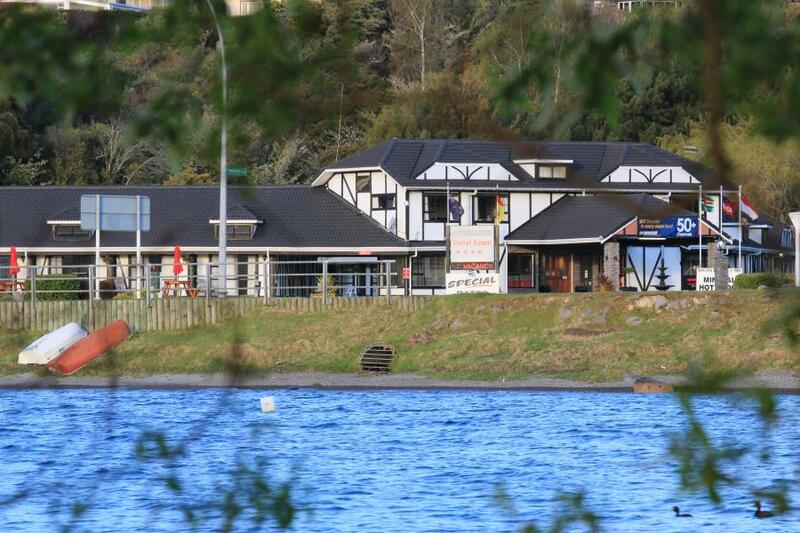 There are BBQ tables and chairs in front of these units for twilight BBQ s. Comfortable units with all that's needed to relax for the week and explore the delights of Taupo or just unwind in-house. 1 Bedroom Unit 1 - 4 persons Spacious one bedroom accommodation complete with own private Ensuité, Genuine Thermal Mineral "plunge pool" room attached to main bedroom. Separate bedroom with queen size bed and two singles in lounge area or vice versa. Kitchen facilities includes cook top / fry pan and microwave, dining table and chairs. Each unit comes with Sky Guest select 60+ channels TV and DVD players are also available. The living area has either a couch or 'Tub Chair' with two single beds and under floor heating. The living area looks onto the private motel courtyard, grass area and picnic tables. These rooms have solid block walls for soundproofing and private car packing at the door. FREE 4 GB Wi-Fi and FREE Guest laundry. Soak in the outdoor (heated all year) pool, go for a bike ride, walk along the lake-shore or even hire a kayak and take to the water. Family Unit with Mezzanine Floor 1-5 Persons This family unit will accommodate five adults or two adults and up to three children. This unit has one bedroom and a mezzanine floor room above the lounge. 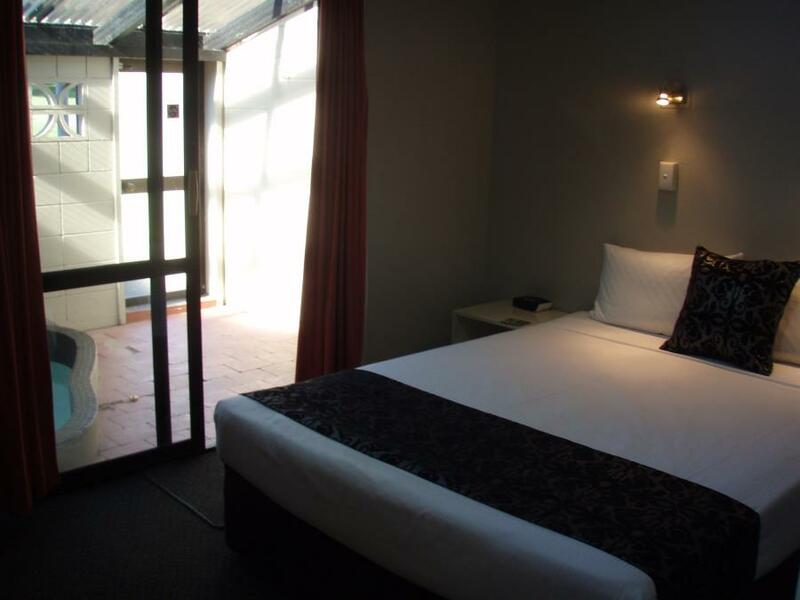 There is a queen size bed in the main bedroom, two single beds on the mezzanine floor and one single bed in the lounge. 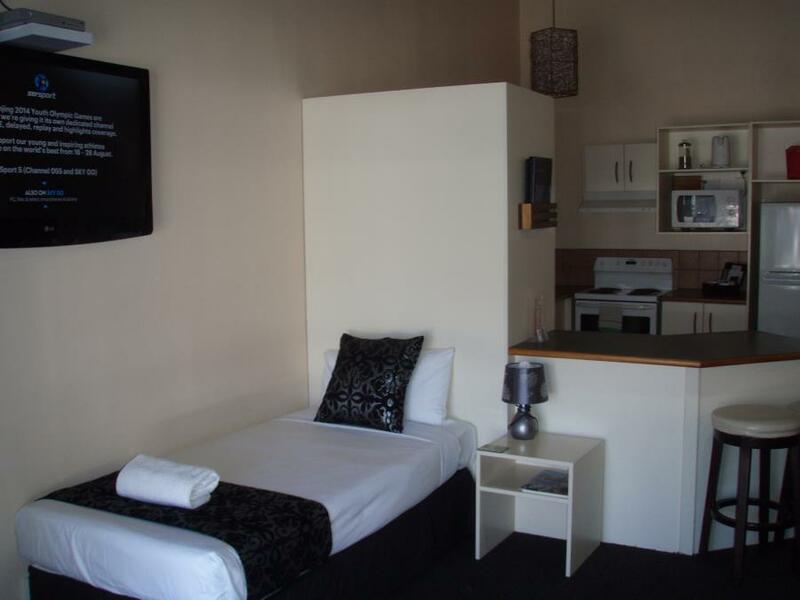 Kitchen facilities include; cook-top, electric fry pan and microwave, Dining table and chairs. Under floor heating, electric wall heater, electric blankets, Private Thermal Pool room off main bed room. Secure parking at your door in courtyard. Just the location for that week’s breaks, a stone throw to the lake edge. Two Bed Room apartment 1 - 6 persons. Spacious Two-bedroom accommodation complete with own private Genuine Thermal Mineral "plunge pool" room attached to main queen bedroom. Separate 2nd bedroom with two singles plus two more singles in lounge area. Full size Kitchen facilities includes standard oven with cook top plus fry pan and microwave oven, insinkerator and dishwasher, 6-seater dining table and chairs. Full lounger area with the seater plus two-seater leather lounge suite. Each unit comes with Sky Guest select 60+ channels TV, and under floor heating. This room has rear access to a private court yard and rear parking if required. The living area looks onto the private motel courtyard, grass area and picnic tables. These rooms have solid block walls for soundproofing and private car packing at the door. FREE 4 GB Wi-Fi and FREE Guest laundry. Soak in the outdoor (heated all year) pool, go for a bike ride, walk along the lake-shore or even hire a kayak and take to the water.